A stakeholders meeting intended to make political parties involved in the Ekiti Elections commit to a peace deal earlier today ended in chaos in Ado-Ekiti, the Ekiti State capital. 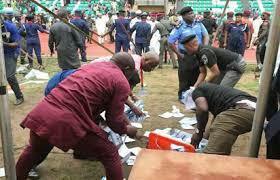 The meeting which was between the Inspector General of Police, Independent National Electoral Commission (INEC) Officials, and stakeholders belonging to the various political parties could not achieve its objectives as it ended in an uproar caused by some of the issues raised at the parley which led to uncontrollable chants in the hall by party supporters. Before the disruption however, INEC had assured the people that the elections will be a reflection of their will; a position also echoed by the IGP who revealed that 30,000 police personnel had been deployed for the election exercise. According to the INEC boss, Professor Yakubu, the fate of the state over the next four years lies in their hands. With less than five days to go before the election commences, the electoral umpire revealed that out of 1.2 million eligible voters in the state, 667,064 voter cards have been collected while about 246,270 others have yet to pick up their cards. The elections are high stakes because the ruling party has reiterated its commitment to capturing political power in the state at all cost. furthermore, the erstwhile Governor, Ayodele Fayose; a PDP stalwart has been a thorn in the side of the Buhari led APC administration.